AX selects the set of tables which is relevant for the particular job run (here: the 1000 – Currency). The change tracking information related to scheduler job <Job ID> and data group <Data group> are only partially available, due to the AX database change tracking retention period setting. A complete snapshot of data will be generated instead. Be careful with this… your target system might only be designed to receive changes and not the full load. What if your 1040 – Product flow would ship out its 150.000 items in the channel’s assortment… So be aware of this function when designing your specific interface flows. So train your system administrators to handle these features in a way which suits your interface designs. As each job ID will trigger a different output flow to the 3rd party system, the job IDs are coupled with a specialized BizTalk process each. However, to avoid having them all polling on the dbo.DownloadSession, a generic BizTalk process is taking care of that task. It’s this process that triggers another BizTalk process to handle the respective Job ID subsequently. 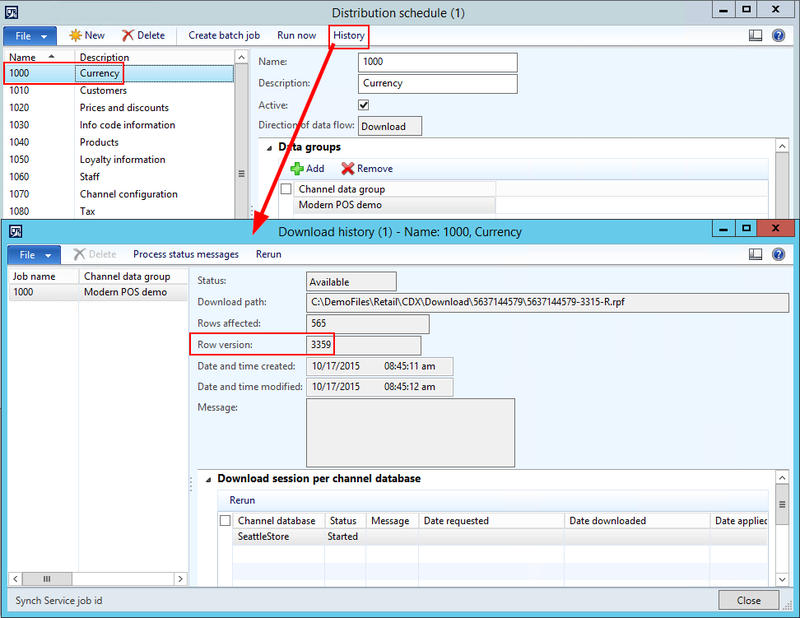 In order for this generic BizTalk process to keep track of the records it has triggered specific BizTalk processes for, change tracking is enabled for the dbo.DownloadSession table. So after each query cycle, BizTalk writes the last change tracking version for the dbo.DownloadSession table into its own local administration. So at each cycle new records can easily be identified and validated. Filtering the records by both the criteria mentioned above and change tracking is done by stored procedure. BizTalk process #1 spots new finished job runs (status = 4) for both flows and triggers BizTalk processes #2 and #3 to figure out if there’s actual data to be shipped to the 3rd party system. Similar to the Async client change tracking mechanism, BizTalk processes #2 and #3 inquire the latest change tracking versions for their respective job runs. For both job runs this is #9000 in this example, but it could have easily been different for each of the flows. In this example, biztalk. [PMOCHANNELITEMSAVAILABILITVIEW] returns the dataset which is the baseline for the output to the 3rd party system. The standard AX/Retail table ax.RETAILINVENTAVAILABILITY is indicated as the CHANGETABLE (=table 1 in our example) and @LastSyncVer indicates the last change tracking version for this job run (version #9000 in our example). So if this stored procedure returns any data, then BizTalk process #2 will have work to do to transform and hand over the data to the 3rd party system. After successful processing, BizTalk process #2 registers a combination of Job ID and last processed change tracking version (#9001) in its administration to avoid any duplicate output in next processing cycles. Process #3 has still the job ID 8010/change tracking version #9000 combination in his administration. So the same original change to table 1 can still trigger process #3 to process his output for the 3rd party system. I hope this blog has given you a better insight of how you can trigger a middleware solution on top of standard AX/Retail CDX.